64-66 Cab w/Floor FCGA-64 $6599. 64-66 Cab Shell no floor FCG-32A $2299. 64-66 Dash Blank FCGA-64D $ 299. 64-66 Drag Package FCG-33P $3899. for as little as $50 w / purchase. FCG-21 $ 499.
for as little as $50 w / purchase. FCG-1 $ 499. 62-66 Cowl Induct. 2" Tilt FCGI-63 $1899. 62-66 Cowl Induct. Hood 2" FCG-1C $ 499. 62-66 Pre-Split 2" Cowl Tilt FCGI-63P $1999. 62-66 Cowl Induct. Hood 4" FCG-1D $ 499. 62-66 Cowl Induct. 4" Tilt FCGI-64 $1899. 60-61 One Piece Front End FCG-74 $1499. 62-66 Pre-Split 4" Cowl Tilt FCGI-64P $1999. 62-66 One Piece Front End FCG-75 $1499. 60-66 Front Fenders pr. FCGF-3 $ 798. 62-66 Cowl Induct. OPFE 2" FCG-75C $1499. 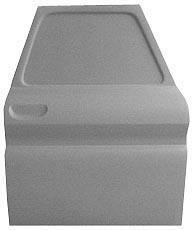 62-66 Front Filler Panel FCGP-60 $ 389. 62-66 Cowl Induct. OPFE 4" FCG-75H $1499. 60-66 Front Wheel Wells pr. FCGW-60 $ 398. 60-66 Front Fenders pr. FCG-43 $ 698. 60-63 Doors pr. FCGD-60 $ 898. 60-63 Doors pr. FCG-62 $ 798. 64-66 Doors pr. FCGD-64 $ 898. 60-63 Door Skins pr. FCG-63 $ 398. 60-66 Doors pr. Rear Sub. FCGD-6S $ 998. 64-66 Doors pr. FCG-64 $ 798. 55-66 Stepside Bed 6' w/fdr FCGB-55S $3999. 64-66 Doors pr. Rear Sub. FCG-64S $ 998. 55-66 Above Bed Tubbed FCGB-55T $3999. 64-66 Door Skins pr. FCG-65 $ 398. 55-66 Stepside Fenders pr. FCGF-59 $ 778. 55-66 Stepside 6' Bedsides FCG-55B $ 899. 60-66 Fleetside Bedsides 8' FCGQ-65 $1098. 55-66 Stepside Fenders pr. FCG-45 $ 778. 60-66 Complete Bed 8' Fleet FCGB-66 $4999. 55-66 Stepside Steps swb FCG-45S $ 229. 60-66 Fleetside Bedsides 8 FCG-52 $ 898. 60-66 Front Bumper FCG-60B $ 189. 64-66 Cabs Short Wheel Base 115" - Long Wheel Base 127"
fully braced for hood hinges. - Windows come blanked in and must be opened during installation. - Door is supplied bare with no glass, mechanism, tracks or hardware. - Full Front and rear roll around with taillight area. - Intended for Race or Modified Show application. for bracing only, not for attachment. - Smooth 90� roll into wheel well. - Gellcoated Fiberglass floors have a ribbed design , eliminating the need for a Wood kit.